Flan, aka creme caramel, was an instant favourite of mine, when I took my first trip to Spain in grade nine. I was on the trip with my uncle and aunt, and at every lunchtime meal, the menu del did (menu of the day) would come with a dessert. I would always order flan! They still tease me about it to this day, but I still love it just as much and order it whenever I get the chance. Flan is exactly like the French version called creme caramel. The bottom layer (which is then inverted to the top layer, which is why the top is darker than the bottom) of flan is a rich caramel, covered then by a creamy and luxurious set custard. This dessert is silky and smooth, rich, but light enough that you don't feel overwhelmed by it. 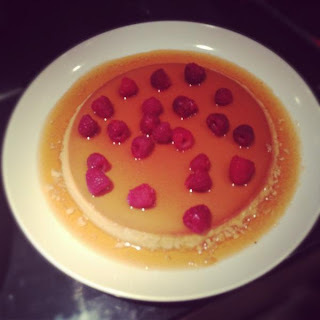 For a dinner party I catered last night, I served the flan with a few fresh raspberries sprinkled on top for colour and a bright taste for the dish. - To make the caramel sauce, add 1 cup sugar and 2tbsp water to a pot on medium heat. Let the sugar begin to dissolve, stirring occasionally until completely dissolved into a liquid form. The caramel will be amber in colour. Be patient! It takes a few minutes! - In a bowl mix the egg yolks, egg, evaporated milk, cream, milk, sugar and vanilla. - Then take your egg mixture, and strain the liquid on top of the caramel layer. - Allow to cool in the fridge for at least 4 hours. - Voila, a beautiful Spanish treat!